This is pretty much it: the most dangerous part of a historic solar-powered adventure playing out thousands of feet above the Earth. For folks who haven’t been following the around-the-world flight of the experimental Solar Impulse 2 since it began last March, this is probably the part where you’ll want to start paying attention. Because what’s going on now is simply amazing. If he succeeds, Borschberg — and his partner Bertrand Piccard, who’s been sharing flying duties along the route — will be the first aviators in history to fly a plane around the world without using a drop of fuel. In the history of around-the-world flights, the Pacific has presented pitfalls for aviation pioneers — most infamously Amelia Earhart, who went missing in the central Pacific in July of 1937. The solar plane’s mission reminds us that there are still many exploration challenges to conquer, even in the 21st century. 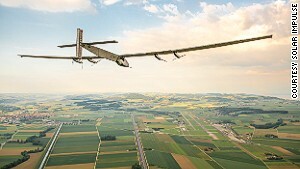 Soaring high above the water, Borschberg now faces hazards that could cripple his plane or even send it into the ocean, including turbulent winds and bad weather; mechanical malfunctions; and the pilot’s ability to remain alert and fly the plane. 2. What if the plane’s engines fail? 5. What if the batteries don’t have enough stored solar energy when the sun goes down? “Above the ocean, sleep will be allowed in the form of short naps lasting up to 20 minutes, 10-12 times a day.” Piccard, who’s also a psychiatrist, “trained himself to only sleep for short periods by means of self-hypnosis — a technique used to dissociate the head from the body.” It “allows the body to regenerate into a very deep relaxation and keep the brain alert enough to check the instruments during the flight.